I thought I’d delve into the nether regions of the New English Library shelves today. I picked out this title quite by random; I think it was one of my wife’s childhood books and it’s been languishing unread for as long as I can remember. I decided to flick through the first few pages this morning and ended up reading the entire thing in one sitting. It’s not great literature by any means (of course it isn’t, it’s from N.E.L. ), but my interest was piqued as it follows on nicely from my last post about folk horror. Let’s have a brief synopsis and see just how this book fits into the folk horror genre. It’s set in the mid-1970s and centred around a young couple, a pair of art school drop-outs. Deciding that art-school is the last place an artist should practise they leave college, rent a barn from a farmer and set up a craft workshop/retail outlet to cash in on the folk art boom of that time. So, we have our innocent outsiders. Of course, they need a steady supply of customers so a tourist trap would be the best bet, where best to set this business up? They decide on the Dark Peak, specifically between Chapel-en-le-Frith and Hathersage. The surrounding landscape is painted quite well by the author and becomes very much a character in itself. We have our isolated and isolating landscape. The female half of the couple is adventurous and enjoys exploring abandoned buildings, ruined churches and ancient monuments. 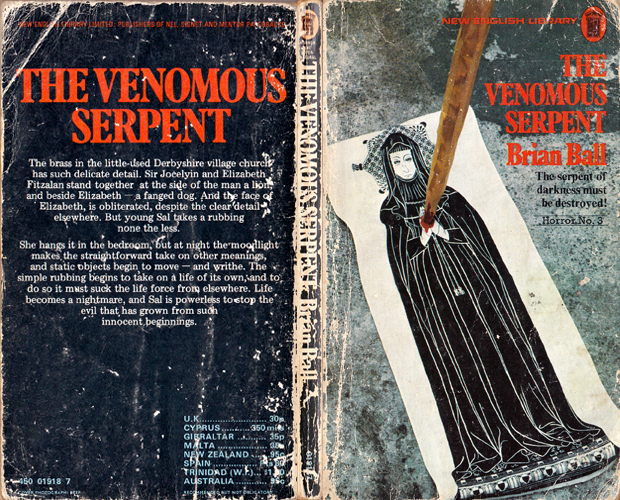 The plot revolves around one ruined church where she finds an old brass, which she takes a rubbing from, depicting the Lord and Lady of the area (strangely, the names on the back cover blurb do not match the names in the text). The Lady on the brass has a strange dog-like creature by her legs and her face has been obliterated. We have our hints of folklore and ancient evils. The tiny village near to the ruined church is an empty and sombre place, the few locals we meet are surly and unwelcoming; the pub is named The Black Nigget. So, the isolation of the outsiders and the folklore element is reinforced. I won’t go into too many details about the plot as I don’t like to spoil these things for those intending to read it, suffice to say the action takes place through the month of April and ends on May 1st! Ball writes with a confident swagger (he even references and advertises two of his other novels within the storyline of this one, which shows magnificent temerity), his characterisations are solid and he builds the plot nicely. He even introduces a comic relief in the middle of the book as a liminal breathing space, this takes the form of a wonderfully eccentric vicar. What lets Ball down slightly as an author is that his descriptive passages can be a little on the flabby side and he has a tendency to verge towards cliché. But, all in all, this is a very enjoyable romp through a ‘70s folk horror landscape. I may well even seek out some of those another novels which the author told me about in such a blatant manner! Tremendous stuff Mr Nash, I loved this post and the included shot of the book – all that wear just adds to the beauty. Of course I’m rather bound to be a little biased as I live quite close to the locations you mention feature in the book and have spent much time wandering around the Peak District and its many ancient, wyrd locations. It’s also good to see you’re a fan of the NEL too, they’re something I always pick up when out book hunting. Another great post my friend, I look forward to the next treasure pulled from your library. All the very best my friend. Thankyou, Mr. Scriber. You’re a lucky man living in the Peak District, a beautiful place and somewhere it’s been too long since I last visited. You seem like a thoroughly decent chap so perhaps the book was doing an injustice and all the locals aren’t ‘surly and welcoming’! We’re a very amiable bunch up here I can assure you Mr Nash. You’d be more than welcome to come and visit sometime, I’d be happy to put you up at unsubscriber towers. I’ve always felt very lucky having such stunning locations on my doorstep and am always keen to show folks around. All the best my friend.